This is a copy of the check which went to the purchase of the Canseco house. The property is located on the corner of Chihuahua and Seymour Ave. I previously wrote about the home's appraisal by a local agency. And I also wrote about the appraisal done by Southwest Appraisal Group. Their valuation was much higher, but they made note that the house was basically useless. 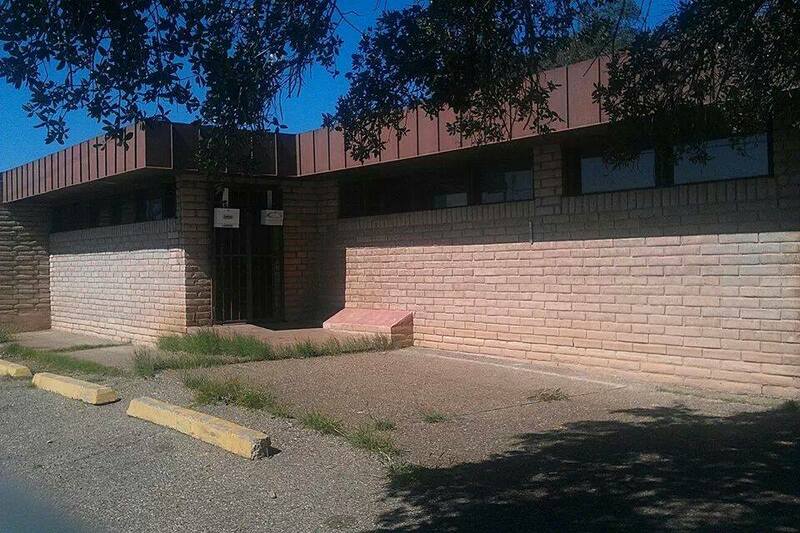 Southwest recommended tearing the house down and developing the property as a commercial site. 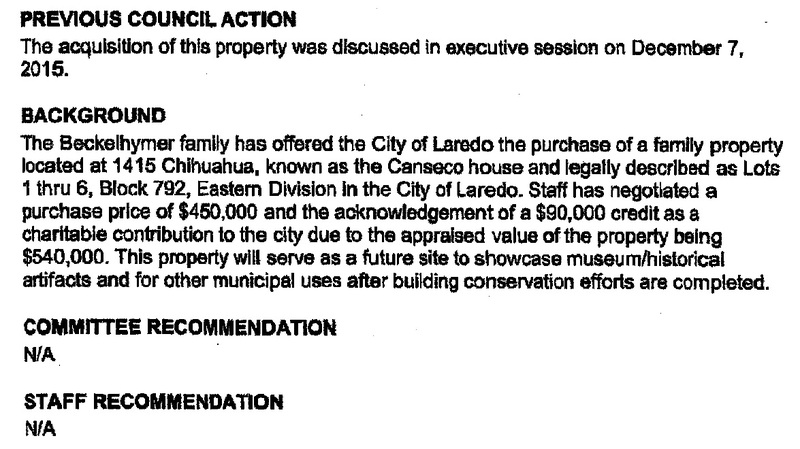 Three weeks ago, at a special meeting, city council made the motion for staff to obtain HUD funds to renovate the CANSECO HOUSE (name that Alex Perez insists on) grounds. The amount they'll ask for is $400,000. Not sure how much they can do with that amount of money, but okay. To make ends meet for the project, Councilman Perez could offer up some of his discretionary funds. And he'll probably have to pass the plate around so his colleagues can fork over some of their district moolah, much like Roberto Balli and Juan Narvaez are doing now for the proposed Don Tomas Sanchez statue. The money will have to come from somewhere. What's troubling about the Canseco house purchasing is that its negotiations took place behind closed doors. 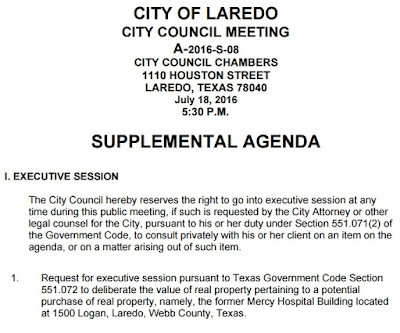 And as of late last month, city hall is up to it again, this time in considering to buy the old Mercy Hospital in the Heights area. Roque Vela compared buying the Canseco house to an unintended pregnancy. The house belongs to the city and they now have to care for it. What we need now to guard against such frivolous purchases is the neutering of city hall. If they can't be transparent and better stewards of public money, then no more playing doctor with willing participants. I haven't paid close attention to county politics long enough to recall if times were as bad as they are now. Lately, it's been one dreadful story after another: corruption, ineptitude, cronyism, infighting, etc. Now commissioners are struggling to get a grip on the budget deficit at hand. We've been told that the budget shortfall is a result of decreased oil and gas lease revenues, but Patricia Barrera sees is another way. Instead of saving that money for a rainy day, putting it away, they would have the auditor come and tell them, this is how much (in) payroll savings; they would change it to different funds, 604 and 605. And in that one meeting, they would spend all the money. So there was never any savings. Our politicians, and perhaps the media as well, like to attribute fluctuating revenues on external forces. But it's clear that our county dads (borrowed that term from Odie Arambula) took it for granted that oil and gas money would always be there. The Eagle Ford Shale play was supposed to provide sustained prosperity to our local economies. Alas, that wasn't the case. As fast as the gold rush came, it went. And now the county has to make drastic changes, among them: cuts to third-party funding, and a proposed 40 percent slash in community center budgets. 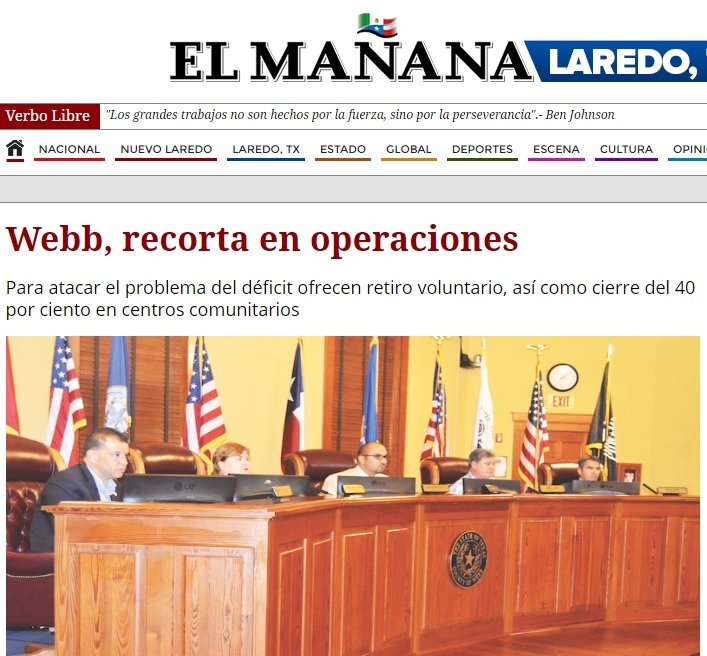 The LMT headline yesterday was: BUDGET MEETING GETS INTENSE: Officials discuss cutting jobs, funding (Judith Rayo). I haven't seen the footage of the budget workshop held Tuesday, but I'm sure it was a doozy. If there was yelling, I want to document that. I'll update this post as things go along. This office used to belong to Dr. Pellegrin, pediatrician. It's where my mom would take us for check-ups. I'm posting two old water bill statements for future reference. 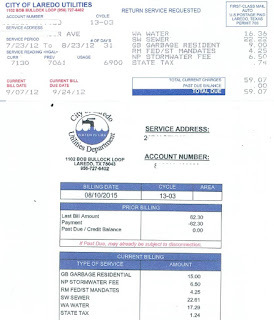 The bill at the top shows a trash fee of $9.00; that one is from 2012. Currently, our trash collection fees is $16.50. My water use has stayed relatively stable. That's a good thing. Somebody at county sent out a poorly-written statement using letter head belonging to one Webb County Judge Cayetano* Tijerina. 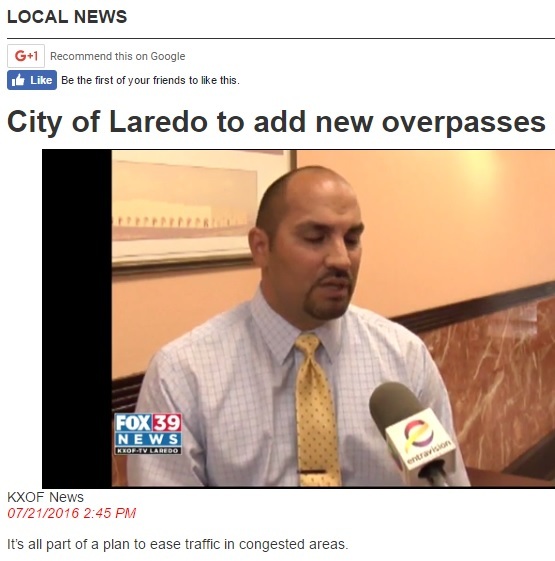 The announcement informed media outlets about the planned construction of overpasses on Loop 20. That's music to Laredoans' ears who have to deal with crosstown traffic. The thing that makes this presser even more cringeworthy is the appearance that Tijerina is taking credit for the roadway additions. 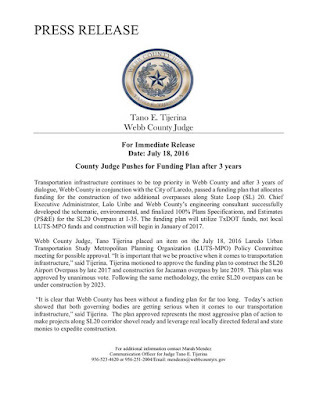 The judge is a member of Laredo's Metropolitan Planning Organization. The group includes city leaders, and they welcome input from the public concerning infrastructure needs. The money for road work comes from the state and federal level. I applaud Judge Tijerina for making himself available to the public: He recently hosted a 'Platica and paletas' event, where he met face-to-face with constituents. But it should be made clear that these road projects he speaks of are a result of our tax money being put to good use. And he's not really representing the county or using county resources for improvements. He's a person (who happens to be the county judge) who sits on a committee that decides how to spend taxpayer money. I know it sounds pessimistic for me to be singling out the county judge, but context matters, I think. Government entities are entitled to public funds like those that belong to the MPO, and the COPS program, and the CBDG program. Updates on progress are good; just don't turn these announcements into political chips to cash in later. Don't include these moments in your re-election campaign. I know it'll be temping to do so, but it just can't happen, especially when the county is facing a major budget deficit due to oil/gas lease losses. Departments are being told to make drastic cuts to their budgets. Colonias won't have any trash pickup any more. The veterans museum is still on hold. 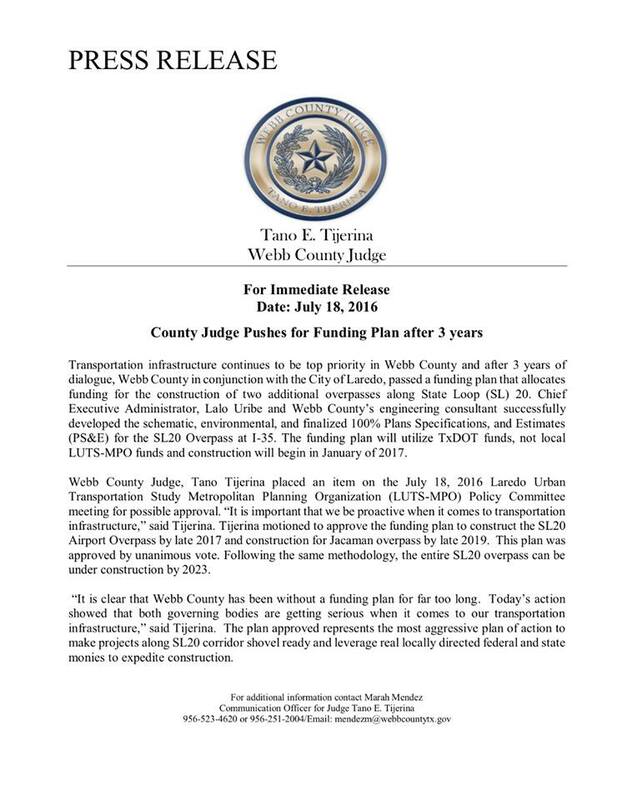 The judge (using official letterhead materials) and the county aren't building the overpasses. The city isn't building the overpasses. What they are doing is administering funds in a prudent manner. (I hope) Thanks for the statement, judge. Now don't speak of it again in a promotional way. This concludes my observation for this week. 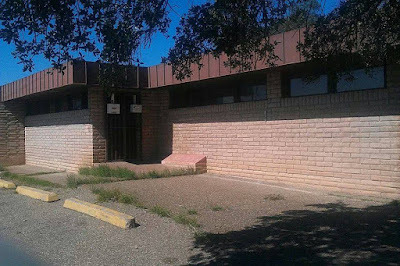 Alex Perez still has a couple of years left on city council and I guess he wants to impress his Heights area neighbors by attempting to clean up the Carranco's mess of a building, the old Mercy Hospital. The facility was vacated in the fall of 1999. It never saw another bright day again. Instead of forcing the owner's hand, the city thinks it's a wise enough idea to tackle the problem on its own. Perhaps they're right. It could be that city hall can put the building to good use in some type of public capacity. It's apparently of no value commercially. 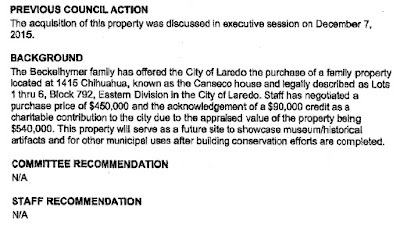 My reservations, however, lie with the manner the City of Laredo has managed other properties they've acquired in the past. Their handling of other locales leaves much to be desired. It's apparent that the old hospital needs to go. But far be it for me to have a say in anything. Only our city leaders know what's best. I'm just waiting for someone to say that the facility will be dedicated to something for the arts. That seems to be the go-to answer for other buildings. The Jesse Martinez shop closed earlier this year. As you can see from the photo it's being taken apart. 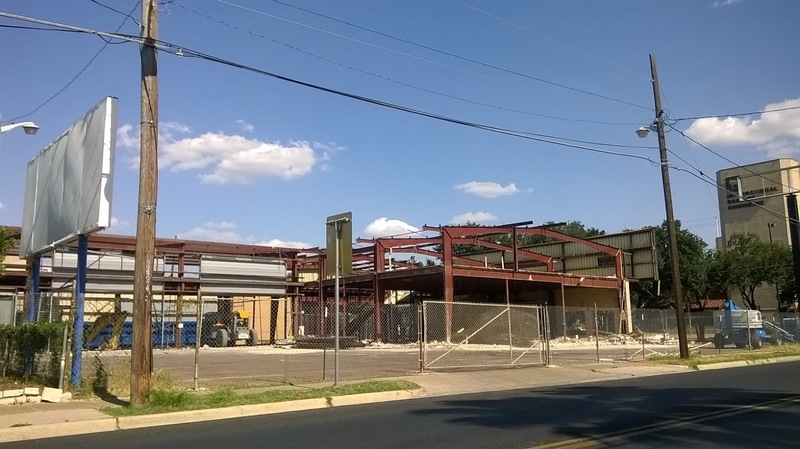 The 'revitalization' of the downtown area and San Bernardo continues. I took the photo after getting something at Wendy's next door. Image below via Google Maps. Labels: Jesse Martinez Auto Center, San Bernardo Ave. I planted a pirul tree for my grandmother about thirty years ago. It stood splendidly along the fence line, attracting passersby to its low-hanging branches which hovered over the curb. Any bold pedestrian took to grabbing a cutting from the tree. For those not familiar with the tree, its branches have a supposed cleansing effect: If you're going through a rough patch, a barrida with a pirul branch will free your body of bad vibes, seemingly. 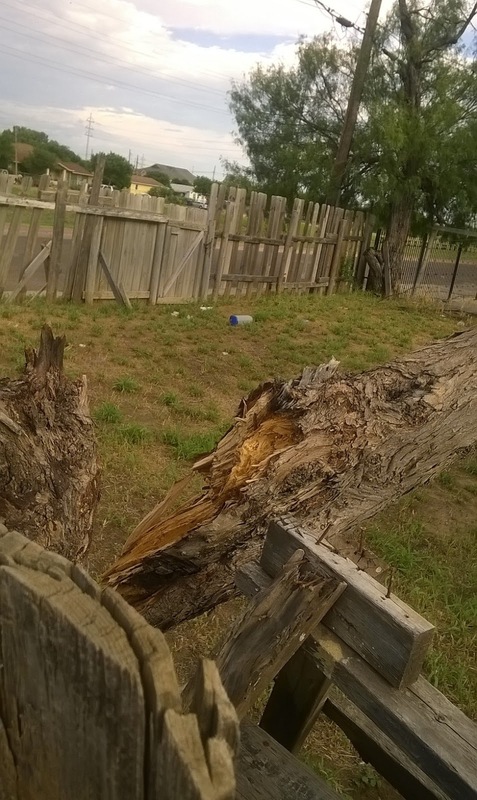 The rough winds that landed in Laredo on June 28 dealt our tree a fatal blow. It endured three decades of brutal Laredo heat. It stood a soft feature against the rough edges of my barrio. My grandmother's former property is more bare now. The vestiges of a former time are fading. The family tree, like our featured blog post specimen, has lost a few battles lately. From here until my own demise, I can only honor those that brought me to this point and the things that brought us together. Who knew that land development could be such a divisive issue? On the one side you have the Killam people - the ones that probably paid for the Laredo Times ad pictured above - Mayor Pete Saenz, Charlie San Miguel, Alex Perez, and George Altgelt. On the other you have Roque Vela, Roberto Balli and the two freshmen council members. 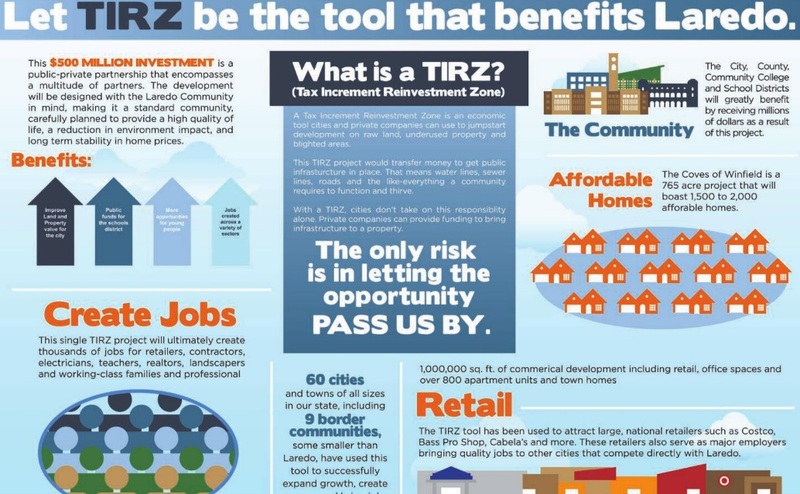 All I know about this TIRZ matter is that the Killam person wants to put up housing and commercial property on his land with the help of our tax money. I don't know how this Coves at Winfield project is any different from other construction endeavors along the loop in north Laredo. But proponents of the plan talk about it like they're re-inventing the wheel or something; and to vote against it would be a huge loss for the city. I understand that the plan consists of developing hundreds of acres of land, and for that, the Killams need help with the financing. But don't paint this as a benefit for the entire citizenry. How is The Coves going to help me in my neighborhood? The Coves plan sounds too good to be true. The city will not take on any risk, or so it has been said. It's an ambitious plan and some people would stand to benefit. But let's talk about it realistically and talk about the shortcomings as well as the upsides. July 1, 2014 KGNS launches ABC affiliate. No more KSAT on cable. July 1-3, 1983 Borderfest took place on these days on Laredo Civic Center grounds. July 1, 1940 Colonia Guadalupe construction begins. Inaugurated September 2, 1941. July 1, 1987 Taco Palenque opens in Laredo. 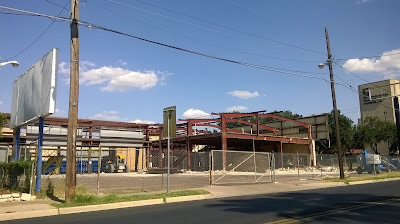 July 1, 2016 Cheers Cocktail Lounge on 7004 San Dario is demolished. July 2, 2017 Movie ticket at Cinemark Mall del Norte is $9.50, general admission. July 3, 2012 Laredo is Safe campaign launches. July 4, 2017 Fireworks display at Tres Laredos Park near Outlet Shoppes. July 6, 1978 Taxpayers Organized for Public Service file with state as non-profit. July 6, 2015 Ground broken on Clark/Loop 20 overpass. July 7, 2018 West Martin Field (Veterans Field) undergoing demolition/remodeling. July 8, 2015 Horizon Group spokesman releases list of stores to open at downtown outlet mall. July 8, 2010 UISD cancels summer classes due to impending flooding. July 9, 1949 Louis Bruni born. July 10 Happy Birthday Meg Guerra of LareDOS. July 10, 2017 Media reports: TABC revokes alcohol license of Mami Chulas. 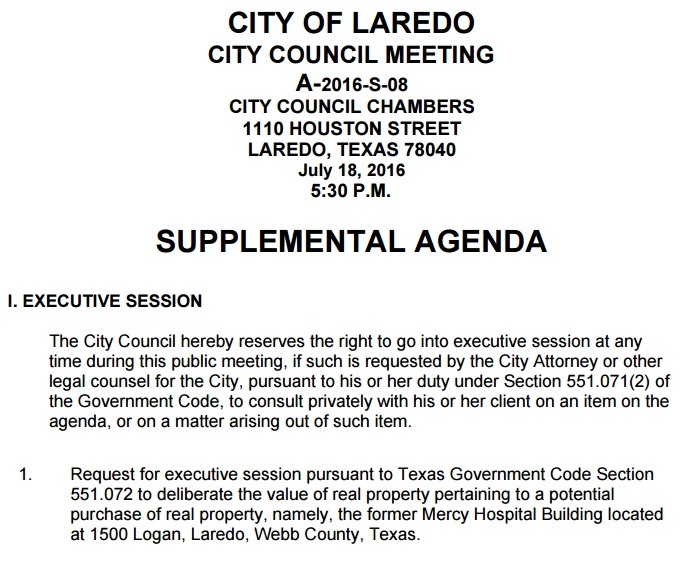 July 11, 2018 Laredo ethics commission meeting is cancelled due to lack of quorum. 3 members resigned for various reasons. July 12, 2011 Posted my first-ever tweet. July 12 Chacon Creek flooding. July 14, 2016 Esteban Rangel loses case in court over ineligible votes in runoff contest. Jesse Gonzalez maintains the win for commissioner Pct. 1. July 15, 2010 Janet Napolitano visits Laredo Port of Entry. July 16, 2015 IBC Bank Annex hosts event w special guest Alfonso Gomez-Rejon. Funds to benefit Plaza Theater restoration. July 18, 2011 Cuatro Vientos Rd. opened. July 18, 1884 State of TX recognizes land grant for Laredo. July 19, 2010 City council picks Robert Trent Jones II to design golf course. July 20, 2015 County Judge Tijerina submits letter to DA’s office to investigate county auditor. Auditor allegedly made illegal purchases. July 22, 2015 Arnulfo “Fito” Santos passed away. Former commissioner and owner of Alfredo Santos Grocery Store. July 23, 2015 Donald Trump visits Laredo. 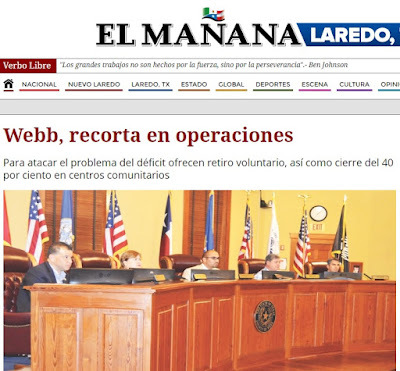 Laredo Times misspells headline. July 25, 2012 Blockbuster in north Laredo starts selling off the last of its merchandise before it closes for good the following month. July 26, 2016 Commissioners voted to cut all third-party funding. County facing huge deficit. July 27, 2018 Judge in 406 District Court awards Annette Bonugli punitive damages in her civil case against Vidal Rodriguez and Alejandra Cadena-Sepulveda. July 29, 1992 Jaime Gonzalez Bath triple murder on Mann Rd. July 30, 2005 Santana concert tix go on sale. LEC cancels show days later after poor ticket sales. July 30, 2016 Our Laredo celebrates its one-year anniversary.